Last month, Woodshed Art Auctions was consigned a portrait painting of a woman, signed Picasso and dated 1939. While examining its condition, a few startling things were discovered. Visual inspection revealed that the painting looked like others from the mid-20th century: Dry paint, an even layer of light grime and dust both front and back, and the stretcher is a style used in Europe. Next, ultraviolet lighting was used to examine the paint. It revealed that the cotton duck canvas was commercially primed with gesso, and then tacked to the stretcher. The age of the canvas and gesso was confirmed when compared to a 1940’s painting in our gallery. 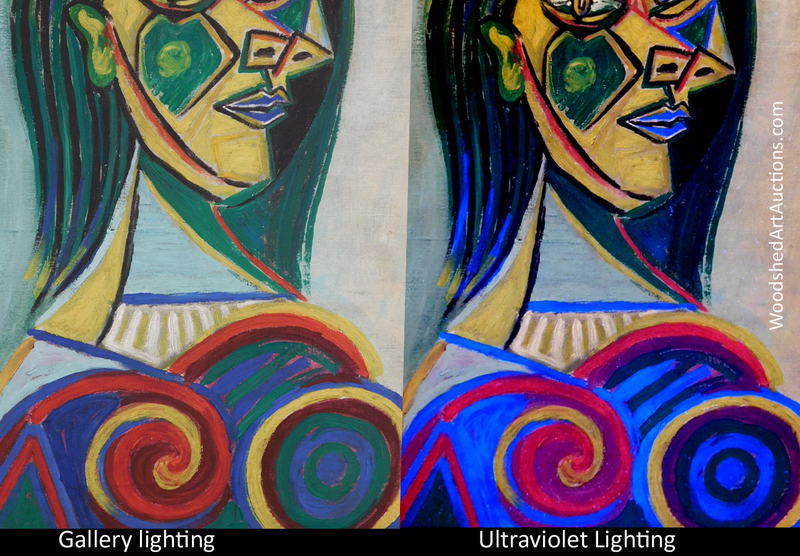 The UV light also showed that the painting was never varnished, and also that it was intact, with no repairs or retouching. But the paint itself was unusual. 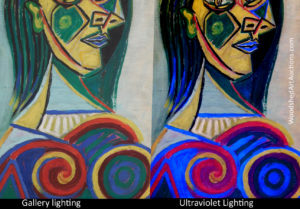 The red and blue areas fluoresced brightly, and overall the lighter paint had a greenish-yellow glow, not the bluish-white glow found in paintings made with flake (lead) white commonly used by mid-century artists. The fluorescent red and blue was unexpected, as they are not common in artists’ paint pigments. It appears that the artist used a combination of traditional oil paints and commercial/industrial paint, mixed with zinc white (which glows yellow/white). UV Lighting reveals industrial pigments fluorescing. A bit of research led to confirmation that Picasso and some of his contemporaries experimented with household and industrial paints. (See one reference here.) Reference books in our gallery’s library also confirmed that in 1939-40, Picasso produced a series of portraits in the style of this portrait, with straight lines, hard edges and outlines defining the contours, superimposed over an organic form. Transmitted infra-red light reveals compositional changes and clues to the artist’s working method. This is evident in (See the central photo above): 1/ A wisp of hair which is over-painted in the finished painting; 2/ A strong horizontal S shape extending from the top of the left eye to under the right eye, 3/ The shape of the nose; 4/A change to the shape of the hat’s brim; 5/A black area below the chin which is over-painted in the finished work; 6/ A change in the shape of the collar, and 7/ A change in the outer shape of the shoulder and breast. All of the material evidence has led us to the conclude that this painting is an authentic, lost Picasso. It is being examined by representatives of the Picasso Estate (Picasso Authentification, Paris) and we await their decision.